Influenza, also known as the flu, can have a powerful effect on an organisation and their workers’ health, attributing to high rates of absenteeism and lower rates of productivity throughout the business annually. Each year, the flu costs Australian businesses more than $2 billion, with an estimated 1,500,000 work days lost each year due to the illness. Unlike a cold, the flu can last for a week or more and individuals can feel fatigue for a period of two to three weeks. The influenza virus is highly contagious, with the infection transferring from person to person before noticeable symptoms are present. 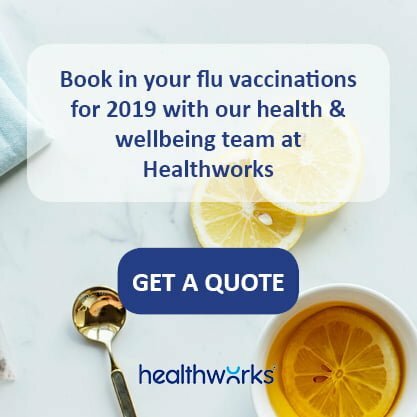 Implementing a corporate flu vaccination program in an organisation involves a specialist immunisation nurse attending your workplace to provide the influenza vaccine to workers onsite. A corporate flu vaccination program is one of the easiest programs to incorporate into your business. It only takes a few minutes out of an employees’ work day and in return, the business reaps long term positive effects associated with employee health costs. over 77,000 vaccinations across more than 1,900 locations nationally in 2018. Once booked, our specialised immunisation team provide the vaccinations in a professional and efficient manner. We also provide off-site flu shots if any staff who are unable to attend on the day of the vaccination program. Studies prove that healthy employees who are vaccinated against the flu have nearly half the number of doctor visits and sick days due to upper respiratory illness, compared to those who were not vaccinated. The flu vaccine and corporate flu shots can also help prevent injuries. Employees who continue to complete their regular tasks when they have the flu are at a higher risk of injury due to 20-40% slower reaction times. Clinical trials results reflect that the influenza vaccine has been shown to be 70% more effective in protecting against the severe effects of infection in healthy adults. The only available influenza vaccine strain for Australians in 2017 is called the Quadrivalent strain, as recommended for flu season by the World Health Organisation (WHO).